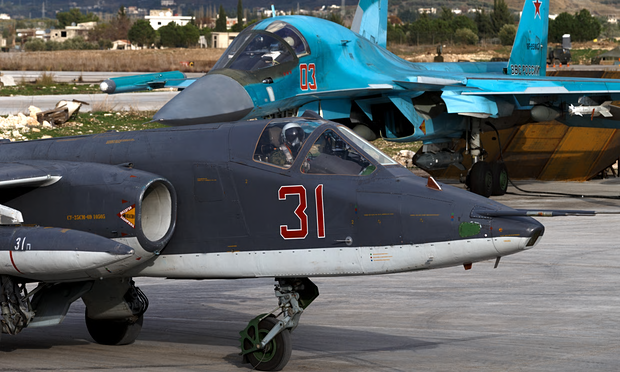 Russian SU-34 as provocation by Russia… or Turkey? Istanbul (AFP) – Turkish President Recep Tayyip Erdogan on Friday expressed alarm over reports of a build-up of Russian troops in northern Syria near the Turkish border, saying such movements would not be tolerated. The devil is at work in our fumbling interventions in Syria-Iraq. Why is the Turkish Sunni president Erdogan so upset about the Russian “troops” in northern Syria? It is a very intricate backstory of American interventionists getting in way over their heads. In their efforts to solve one problem, they are creating a far greater one, bringing us to the brink of disaster. Why is the State Department and the US military leadership so amateurish when dealing with these middle eastern countries? Whereas they have centuries of bargaining experience, we bring only hubris to the table. They outfox us every time. That is why Iraq now has a Shiite government and a country in shambles, all thanks to US intervention. But that is an old story. The current story starts with what was framed as a clever deal. President Erdogan agreed to base US strike aircraft in Turkish airbases in order to save a little fuel and afford more time over targets. We thought we were being very smart by asking him to participate in the air war against ISIS. He jumped at the deal. But Erdogan, who is on his way to becoming the supreme ruler rather than the president of Turkey, is a sly fox and is closely aligned with Saudi Arabia’s Sunni rulers. What we got out of the deal was not sustained attacks against ISIS, but air strikes against our allies, the Kurdish forces on his border, who are sworn enemies of the Turkish government. How could US negotiators fail to understand that Turkey has functioned as the facilitator in sending foreign fighters to join ISIS, arming them, and transshipping their oil output for years? Why did they ignore that just a short time before the air basing deal Turkey precipitated yet-another a confrontation with the Kurds? It gets even more convoluted. Russia decides to get into the fray to buy some time for the Assad government because they are beginning to feel that ISIS will soon be on their border if some space does not open up for a peace deal to be made in Syria. Within a month or so of the Russian intervention they have flown almost as many anti-rebel and ISIS missions as the US has flown in a year. Fast forward. Turkey shoots down a Russian aircraft which violated its airspace for 17 seconds. Why? I believe the plane was on a mission to protect our allies on the border, the Kurds. Putin is smart and he is not going to do anything wild like attacking Turkey. But he is going to let Erdogan know that the payback will be that Turkey can no longer attack the Kurds in Syria by air or ground. Russia is now totally committed to providing air cover to the Kurds on Turkey’s border as a reply to Erdogan’s shooting down of the Russian plane. They have started building an air base there. That is why Erdogan is trying to provoke us into getting involved. For once let’s try to do the right thing. If Turkey does something stupid again, something they may be thinking about according to the latest reports, let them sort it out with the Russians. My response is the US while doing stupid things has a very clear agenda that is never discussed in the media. That agenda is to disrupt the mid-east. American hubris is such that they really don;t care that much for faux pas on their part. As Cheney once said, every error is another opportunity; ie, to do more damage. Read a piece this past week that looked at a document or set of documents from post Koren War. It/they were policy papers that outlined the long term hegemonic goals of the US. Destroying the Mid-east was part of the package. The vastness of the military is such that it is always in the close background ready to be pulled out for another set of Shock and type assaults, similar but bigger than what Isreal does to the Palestinians every year of two. Of course now that Russia is actively engaged, the US will hold back a bit due to the ability of Russia to exert an equal response, something no other country can do. So it is one thing to criticize US policy but quite another to critique isolated episodes. Doing so only serves to narrow the focus and consequently miss the big picture. “That agenda is to disrupt the mid-east”. Yes. “it is much worse” in places where the U.S. military has made it much worse. Swarms of refugees always flee countries where life has become impossible due to rampaging “professional” armies. Therefore, as Jill Stein of the U. S. Green Party says: dismantle the U.S. military and close America’s unnecessary, wasteful, and provocative U.S. military bases abroad — just for starters. As I believe the doctors like to say: “First, do no harm.” So, again, the U.S. needs to get rid of its standing military albatross and (re)criminalize war profiteering — just for starters. Not making things any worse will do for a beginning. “Why is the State Department and the US military leadership so amateurish when dealing with these middle eastern countries? Whereas they have centuries of bargaining experience, we bring only hubris to the table”. When did the US government last negotiate seriously and in good faith with anyone? Not the Native Americans, nor the Spanish, nor the Cubans, nor the Filipinos, nor anyone in South America or Africa, nor the Soviets, nor the Nazis (yes, that’s right – they even swindled and misled the Nazis! )… and on and on and on. The US government’s approach to foreign policy has always been to demand what it wants, and if anything less is conceded, to destroy the other parties as utterly as it can. When your only tool is a hammer you may become adept at driving nails, but you will perhaps fall short when it comes to threading a needle. For starters, our General Officers Corps are MBA armchair warriors, who often were drawn from the ranks of fighter pilots. The one segment of the Officer’s Corp which is never integrated into the actual functioning of their Services. As junior and field grade officers, they rarely are given experience with the logistical and administrative intricacies that line officers are exposed to. The fighter pilot fetish of the 1990s Air Force decimated the Service and raises the question of whether they should be brought back under the Army. ” If you support the man, you should work for the man.” CSAF McPeak. The worship of the ‘warrior’, without a deep understanding of the entire military machine is a recipe for disaster. An excellent capture of issues. However, drug testing of officers is sharing – like showing up to take the physical fitness test and be graded accordingly. I hold that officers skipping the APFT is a sure sign of failed leadership. Robyn.. thank yu for a very interesting analysis of ‘business’ management and ‘military’ management. I just finished the book “Retreat” on the German retreat following their assault on Moscow in WW II and it buttressed your arguments on ‘military ‘management’. The effect of ‘privatizing” all “common” governmental responsibilities like schools, sanitation, health care, etc. has been a goal of both of our political parties since the Reagan catastrophe and has not been limited to the military. The space for the ‘commons’ has shrunk considerably in the last thirty years. Although U.S. interventions and foreign policy are masked in the national interest they are often embedded in misjudgment and folly by U.S. leaders because preconceived and faulty agendas supersede what is best for the nation. Failure follows the nation across the globe and the political hosannas and mainstream media news are smoke screens shielding a devastating reality. Sever the apron strings to Turkey? Not gonna happen! Turkey is an aspiring member of the EU (though one may advise them they better get in quick before that experiment falls by the wayside! ), and far more importantly a member of NATO. Thus, the US is bound by treaty to come to Turkey’s defense in the event of a Russian-Turkish clash. Yes, some treaties the US actually does live up to! It would be the end of NATO–something this writer would shed zero tears over–if the US abandoned Turkey. The last time I checked a map, I could not find Turkey — or Greece or Italy for that matter — anywhere near the North Atlantic Ocean. As well, I have never understood what business the “North Atlantic” nations have in Afghanistan or Libya. Obviously, they have no business in any of these far-away places, and certainly no business bombing them. But the U.S. likes to claim that it has lots and lots and lots of “allies” (or “vassals,” as Russian President Vladimir Putin likes to say) and so NATO serves as a public relations source of “numbers” that supposedly indicate to gullible Americans that their government has lots and lots and lots of like-minded governments on its side. The U.S., like Misery, loves all the company it can get — or manufacture. So the U.S. manufactured NATO. NATO has no reason to exist and Turkey has even less reason for joining it. Until quite recently, Turkey had very good relations with Russia, and certainly has no natural reason to need protection from Russian “aggression.” Also, as I recall, when Turkey and Greece — both NATO members — started fighting over the island of Cyprus, the U.S. did not get involved fighting for one side or both sides just to get in on the fighting — the usual American motivation for its military activities. Therefore, if the Turks think that the U.S. will suffer casualties and risk military humiliation over Turkey’s neo-Ottoman fantasies, then Turkey will find the U.S. once again an absent ally. Maybe fairly soon our havoc-wreaked planet will be divided into corporate fiefdoms who impose obedience with well-compensated mercenaries who *could* advance into quite more highly remunerated courtier categories of employment (e.g. legal eagles, CEO’s and other high echelon management positions, select scientists/technicians — an unlikely prospect except for a rare and fortunate few), who may maintain a far higher standard of living than the populace they control with any martial force necessary to quell even minor insurrection by faithful obedience to corporate policy directives, or who will suffer enormous economic loss of ever dismissed from military/police forces back into competition for insufficient resources with all the rest of the population at large. But suppose some circumstance prevents the formation of a global feudal police state, and actual individual nations continue to exist which compete economically in a fashion more or less similar to the prior millennium-I know, I know, unlikely as hell; but say it somehow turns out this way. If so, at some point USA influence will wane, its economic power steadily leveling down to parity near the planetary mean, and its military dominance will cease to be sustained. Fawning nation’s obeisance a la post-WWII reconstruction will end, sums of American foreign policy expenses will be tallied, scores will want to be settled. Ocean makes military payback on the North American continent relatively unlikely; climate change and resource depletion, soil not least among them, mean NA will not be much of an invasion conquest prize in a century or so, anyway, assuming a sufficient such force could ever be assembled and successfully wielded. Still, one of the oldest punishments ever is banishment. Someday not so long from now Americans who were not alive while a century (and counting) of disdainfully aggressive and repressive US foreign policy enactment created an easily established record of infliction of death, injury, disease, theft, corruption, undermining and often destruction of national governments — the totality of which vastly offset the amount of international positive action on the opposite side of the scale — those not-so-guilty Americans may well suffer some unpleasant payback just when a helping world community hand is wanted most. Typical of all of known human history, of course, the architects and principal enablers — with the rare exception of the scapegoated, and some few bumblers, & that minute amount from time to time ensnared by the legal system — will live large and long, financially well insulated from any sort of blowback for their actions (and many generations of theirs following on, as well), contemptuous of all enduring a lesser fate. Gene expression is too often still primitive, with gratification of the immediate exerting precedence over considerations for the long haul. I predict that in less than a century “the .00001%” will have made their homes on other planets, having brought our home world to environmental destruction. Unless enough peasants with pitchforks and torches can rally to stop them from reaching their escape vehicles! !